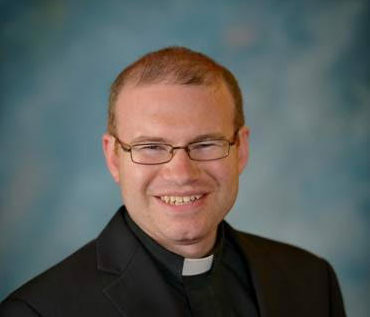 PORTLAND—Deacon Kevin Upham, a Portland native and graduate of Saint Joseph’s College in Standish, will be ordained to the priesthood by Bishop Robert P. Deeley on Saturday, May 26, at 10 a.m. at the Cathedral of the Immaculate Conception in Portland. All are welcome and encouraged to attend the celebration. Deacon Kevin has completed his clerical studies at Saint John’s Seminary in Brighton, Massachusetts. The beginning to his journey to the priesthood can be traced back to early life. Born in Portland, Deacon Kevin and his family moved to Holliston, Massachusetts, when he was six months old. He would grow up in the town, located about thirty miles southwest of Boston. At the age of 13, he first had thoughts of becoming a priest one day. Deacon Kevin returned to Maine to attend Saint Joseph’s College in Standish, where he earned a degree in communications. After college, Kevin spent six years working for a bank but, along the way, he always felt a special connection to the Church. In 2012, Kevin discerned further, entering St. Mary’s Seminary & University in Baltimore, the nation’s first and oldest seminary. In August of 2016, he continued his clerical studies at Saint John’s Seminary. Along the way, he completed summer assignments at parishes in Augusta, Old Town, Bangor, Rumford, and Portland, and participated in the clinical pastoral education program at Maine Medical Center in Portland. Last June, Upham was ordained to the transitional diaconate by Bishop Deeley, indicating that although he will always be a deacon by virtue of his ordination, the expectation was that he would one day be ordained to the priesthood. As that day approaches, Deacon Kevin is filled with joy and gratitude. His parents, grandmother, aunts, uncles, cousins, and friends, as well as former neighbors and co-workers will gather together on May 26 to watch the boy who once served as lector at St. Mary Church in Holliston become a priest. Media members are welcome to cover the ordination on May 26. For more information, contact Dave Guthro, Communications Director for the Diocese of Portland, at (207) 321-7810 or dave.guthro@portlanddiocese. org.